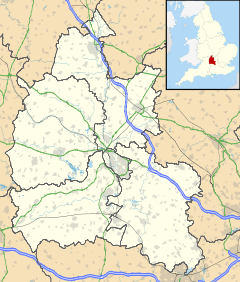 Alvescot is a village and civil parish about 1 1⁄2 miles (2.4 km) south of Carterton, Oxfordshire, England. The 2011 Census recorded the parish's population as 472. A Neolithic stone hand axe was found at Alvescot. Petrological analysis in 1940 identified the stone as epidotised tuff from Stake Pass in the Lake District, 230 miles (370 km) to the north. Stone axes from the same source have been found at Kencot, Abingdon, Sutton Courtenay and Minster Lovell. The Church of England parish church of Saint Peter is cruciform. The font is Norman and 12th- or 13th-century. The north transept and blocked north doorway are early 13th-century. The hoodmould over the south doorway is either late 13th- or early 14th-century, and the south porch was added in the 14th century. In the 15th century the nave was rebuilt and the present Perpendicular Gothic south transept and west tower were built. In the 16th century the south wall of the south transept was rebuilt and the present piscina in the south transept was inserted. St Peter's was restored in 1872 under the direction of the architects William Slater and Richard Carpenter. It is a Grade II* listed building. The west tower has a ring of six bells. Abraham II Rudhall of Gloucester cast the tenor, second and fifth bells in 1727. Robert and James Wells of Aldbourne, Wiltshire cast the fourth bell in 1796. George Mears of the Whitechapel Bell Foundry cast the third bell in 1859. The Whitechapel Bell Foundry also cast the treble bell in 1985. St Peter's parish is now part of the Benefice of Shill Valley and Broadshire, which includes also the parishes of Black Bourton, Broadwell, Broughton Poggs, Filkins, Holwell, Kelmscott, Kencot, Langford, Little Faringdon, Shilton and Westwell. Alvescot used to have a Baptist congregation. Its former chapel is now a private house. There was also a Methodist congregation, but its chapel was demolished in the 1990s. In 1873 the East Gloucestershire Railway between Fairford and Witney was opened. It provided Alvescot railway station just outside the village on the road to Black Bourton. The Great Western Railway took over the line in 1890 and British Railways closed it in 1962. Alvescot has a public house, the Plough Inn, and a Church of England infants' school. ^ "Area: Alvescot (Parish): Key Figures for 2011 Census: Key Statistics". Neighbourhood Statistics. Office for National Statistics. Retrieved 2 November 2014. ^ Sherwood & Pevsner 1974, p. 421. ^ Historic England. "Church of St Peter (Grade II*) (1198102)". National Heritage List for England. Retrieved 28 June 2013. ^ a b c d Davies, Peter (3 January 2013). "Alvescot S Peter". Dove's Guide for Church Bell Ringers. Central Council of Church Bell Ringers. Retrieved 28 June 2013. ^ Archbishops' Council (2010). "Benefice of Shill Valley and Broadshire". Church of England. Archived from the original on 26 December 2012. Retrieved 28 June 2013. ^ "St Peter's Church of England Infant School". Archived from the original on 23 September 2009. Retrieved 27 July 2009. Sherwood, Jennifer; Pevsner, Nikolaus (1974). Oxfordshire. The Buildings of England. Harmondsworth: Penguin Books. pp. 421–422. ISBN 0-14-071045-0. Wikimedia Commons has media related to Alvescot.